I’ve found some lovely upcycling blogs lately and they’ve inspired me to think of some ideas myself and share these ideas with them. A brilliant opportunity presented itself today. A perfect opportunity presented itself today. When I babyproofed the flat a while back, the one thing I left unsafe was my collection of plastic bags under the kitchen cabinet. I always have some reusable shopping bags with me, but there’s always the time you’ve forgotten them or you spontaneously pop into a shop. So we do always have some plastic bags at home that I then use for all sorts of things. As F. seems to be about five minutes from crawling, it seemed high time to move them now. 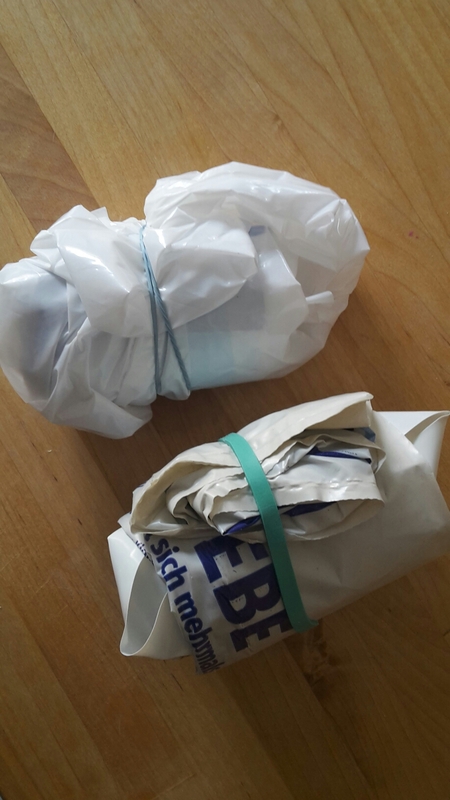 Fold your plastic bags into tight packages and fixate them with rubber bands or pieces of string. Cut a hole into front of the box, fairly low down but leaving a narrow strip below the hole. Hold one to the rectangle you’ve cut out for later. 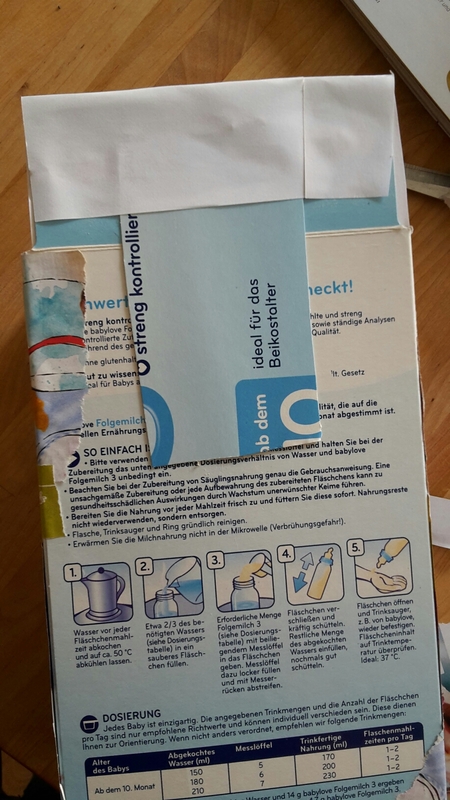 Remove three flaps at the top, leaving the one at the back of the box. 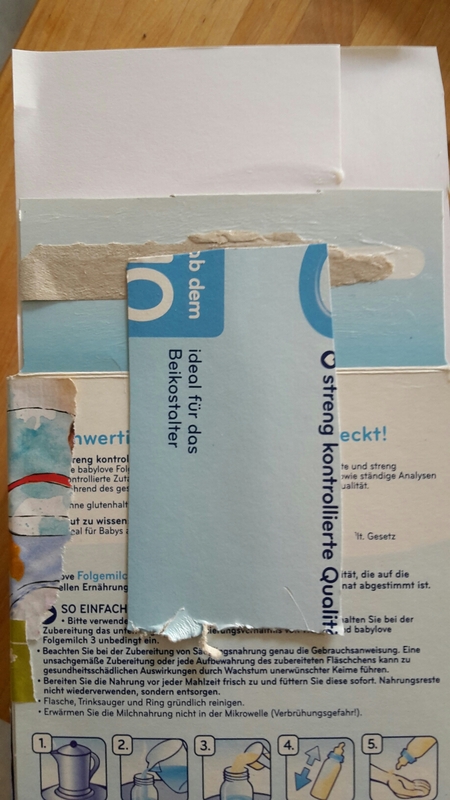 Glue some white paper over the front of the flap, with some paper sticking over at the top. 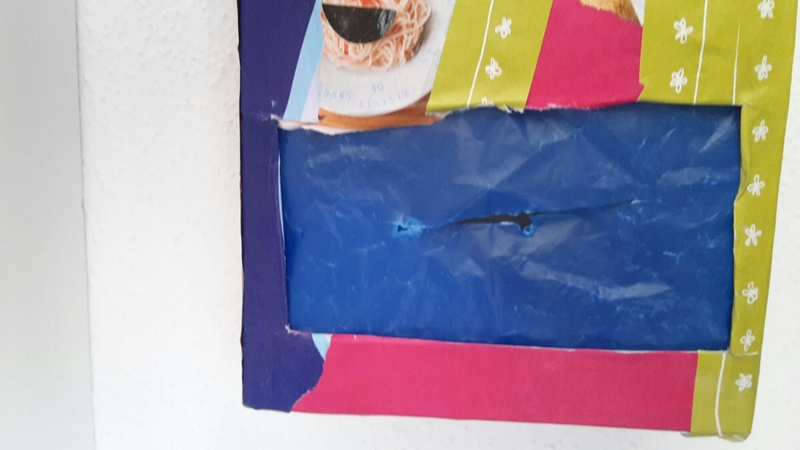 Get the rectangle you cut out of the box earlier and glue it onto the back, connecting the flap and the back of the box. 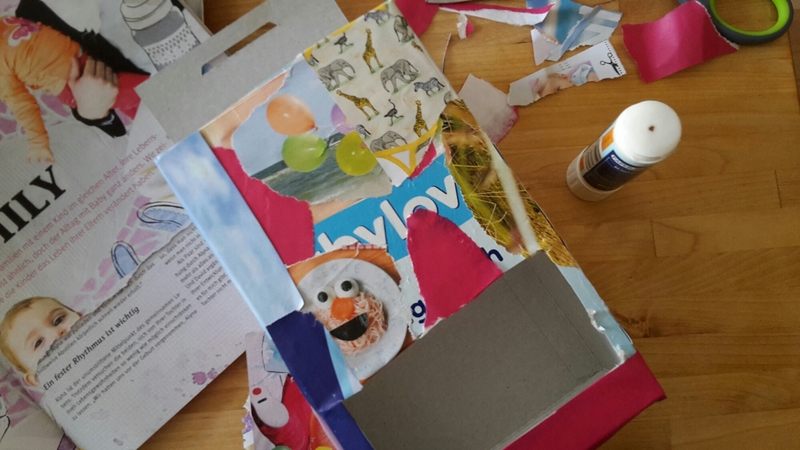 Fold down the paper and glue it over the top of the rectangle. This will add support to the bit you’ll be hanging the dispenser up on later. Decorate the dispenser (sides, bottom and front) however you like. Paint it or cover it in old stamps, buttons or – as I did here – strips from magazines. Anything goes and this is a great opportunity to reuse some more stuff you might otherwise throw away. 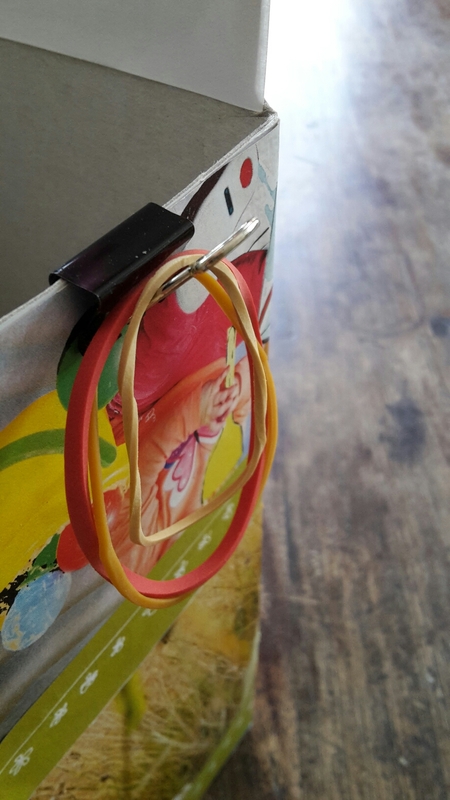 Attach a metal binder clip to the side of the box, folding in the inside part and leaving the outside one sticking up. This is where you can keep your rubber bands or pieces of string. Hang your finished dispenser up on the wall with drawing pins or nails (depending on your wall). It’s important to also attach the centre of the box by reaching through the hole and nailing the back of the box to the wall. Now fill the dispenser and start dispensing! Extra tip: if you want to dispense smaller and harder items, you’ll need a cover for the hole. For this, cut a rectangle from a plastic bag. The rectangle should be slightly bigger than the hole in your box. Cut a slit into the centre that’s big enough to comfortably remove the items to be dispensed. 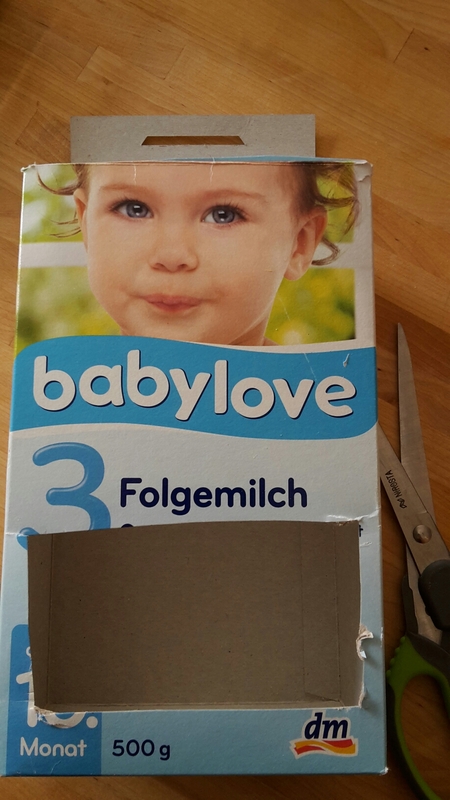 Alternatively, cut the rectangle from the top of a dispenser bag for wet wipes or the like (this way, a neat opening will have been pre-cut for you). Tightly glue the plastic cover to the inside of the hole. Let the glue dry well before you fill the dispenser. I’m really happy with the result and I think I’ll be making some more of these soon for other things. Next up is one for nappies. It would be so convenient to have a neat dispenser for them above where I change F. And as they’re all of identical size, they are perfect for the concept of course. I’ll just have to make it a bit bigger than the current nappy size to ensure we’ll be able to use it fora while.